The city of Edinburgh, the capital of Scotland, is unlike most other cities anywhere else. There is the mixture of the old and the new, as you would expect, but in Edinburgh it is more a case of the Old and the New. 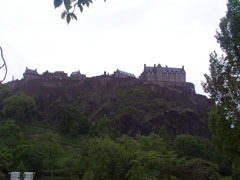 Like Stirling, Edinburgh is dominated by a castle on a hill, a landmark that is visible for miles around. Edinburgh was originally known as Din Eidyn, the Fort of Eidyn, until 638 AD, a reference to the fort that stood on the site where the castle now stands. The original burgh of Edinburgh, which is known as the Old Town, was built around the narrow ridge that led down from the castle to the Palace of Holyroodhouse, at the bottom of what is now known as the Royal Mile, and Holyrood Park. Edinburgh became a town and a royal burgh in the 12th century and in 1329 Robert the Bruce granted a charter which gave the town jurisdiction over the Port of Leith. The burgh was later enclosed within the Flodden Wall, built after the Battle of Flodden in 1513. In fact, the bottom part of the Royal Mile, Canongate, was outside of this wall – as a separate burgh. For 200 years the wall marked the boundary of Edinburgh and as a result restricted the development of the town. As the population of Edinburgh grew so did the tenements that housed them - up the way instead of out the way. With the growing population, the town was becoming overcrowded, so it was decided that expansion outside of the wall was required. Land to the north of the Old Town was cleared of trees in preparation for the building of the New Town. This initially comprised the section immediately north of Princes Street Gardens, which was previously the location of the Nor’ Loch. The development of the New Town continued north, as far as the Firth of Forth, as well as further east and west. As this expansion continued a number of small villages became part of the City of Edinburgh. Edinburgh is also known as the Athens of the North due to the many writers and visionaries who made this their base. The monuments on top of Calton Hill also contribute to this description – and more recently the city has hosted an annual festival, which takes place each August, along with a number of smaller festivals during the year. For a tour of Edinburgh where better to start than the castle? It is the part that most visitors head for; it also happens to be where the story of Edinburgh itself starts. For anyone looking to visit Scotland's capital from outside the country, they might want to consider looking for cheap flights to Edinburgh airport.